We will call you back if it suits you best. You need a spare part or would like to expand? 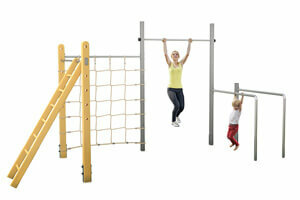 Happy children, satisfied parents, enthusiastic fitness freaks: We have great products for everyone.. Planned, developed and manufactured in Osnabrück. The structure worked well and I am fully convinced of the quality. 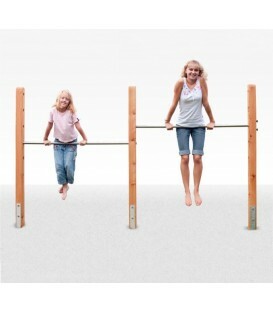 The bar is very stable and brings a lot of fun to our whole family !! Hello dear Turnstangen team, enclosed two photos of our new double-decker with climbing net. The kids love it! 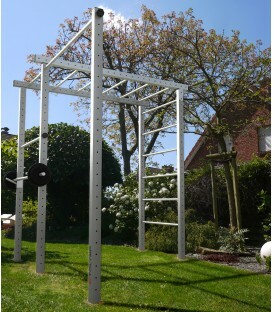 Place the gym virtually and realistically in your garden. You get a good impression of appearance and size at the later installation site. Download the free app now on your iOS or Android device and test your favorite product. 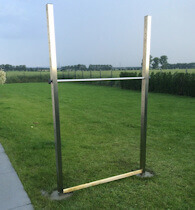 Place the Turnreck virtually and realistically in your garden. Get a good look and size at the later site. 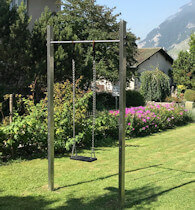 Would you like gymnastic equipment made of V2A stainless steel and therefore of very high quality? Then your search has come to an end. 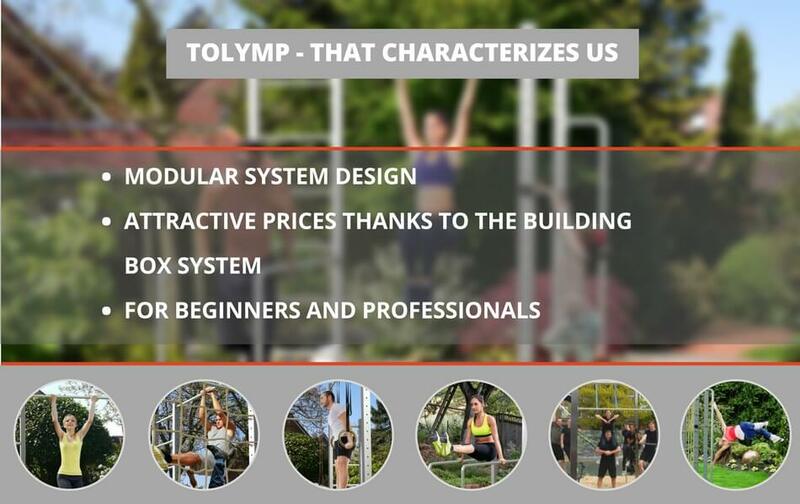 TOLYMP is your contact and supplier of high-quality fitness centres, sports equipment, climbing frames and much more. In doing so, we rely on high-quality workmanship using stainless steel. The advantages of stainless steel are discussed in more detail in the following text. 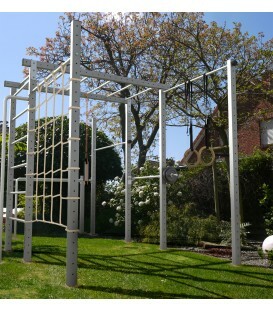 Our gymnastic equipment for the garden is very special sports equipment. 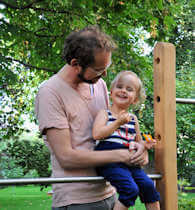 Not only do they make children's hearts happy, but they are also suitable for sporty parents and other family members. Finally, you can grow on our products and extend them, for example, with a swing or a wall bar. 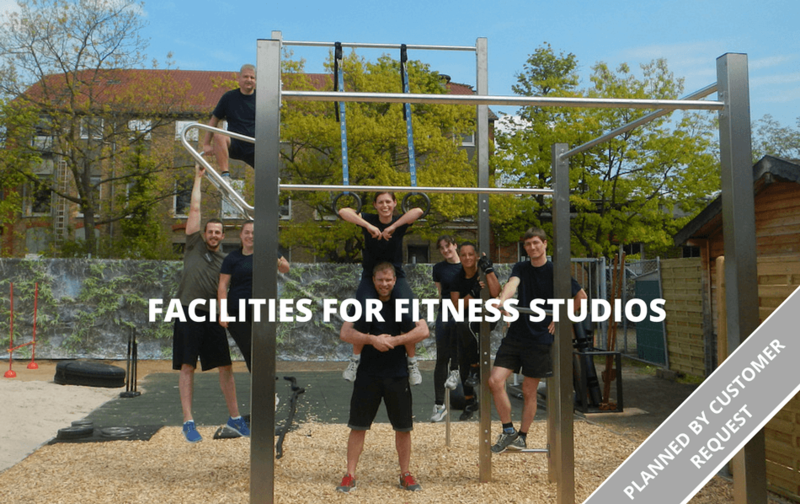 In the area of sports and fitness, we are particularly strongly represented in the fitness segments Calisthenics, Outdoor Fitness and Freeletics. The three sports mentioned do not involve strength training through additional weights or dumbbells, but through one's own body weight. In the long run this is much healthier for the passive as well as for the active musculoskeletal system. 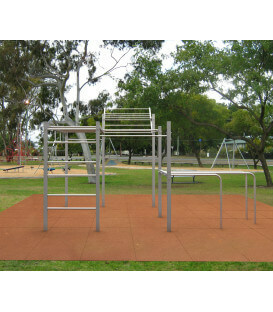 Even kids at a young age can use our stations for children's gymnastics and thus promote their growth. 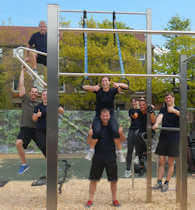 We stand for healthy fitness, which can even take place in the fresh air. 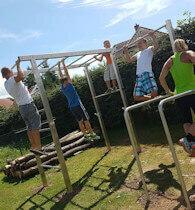 Not only the fitness enthusiasts have fun with it, but also parents who want to stay fit and their offspring. 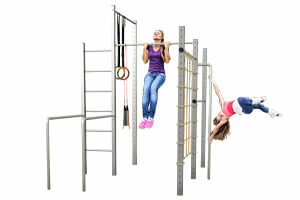 What can our gymnastic equipment? Our articles and goods are manufactured locally in Germany. 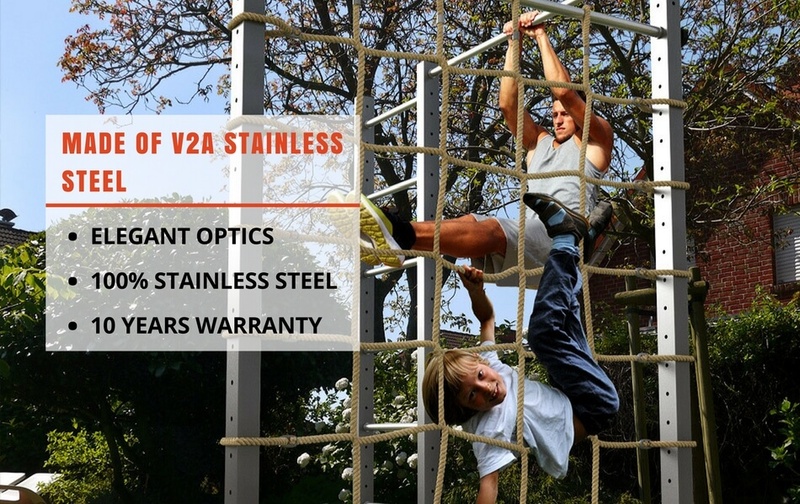 For this we exclusively use high-quality V2A stainless steel. The advantage here is that it cannot rot and mold. 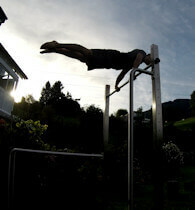 A wooden gymnastic bar will dissolve over time, so that a certain stability can no longer be guaranteed at some point. 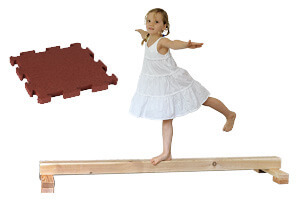 This is fundamentally different with our gymnastics equipment. That is why we have developed Steelwood combinations. After all, wood is much cheaper and some like the look of the wood more. We would also like to emphasize the versatility. 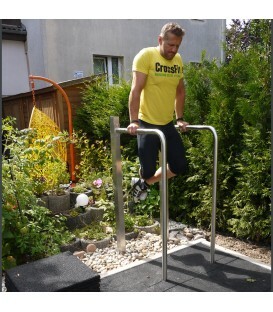 With our selected equipment you can do a lot of training like Freeletics or Calisthenics. As already mentioned, fitness workouts with your own body weight are still the healthiest. 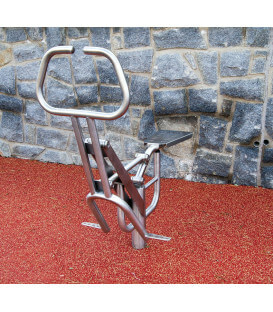 In addition, our gymnastics equipment can be supplemented with further elements and attachment models. 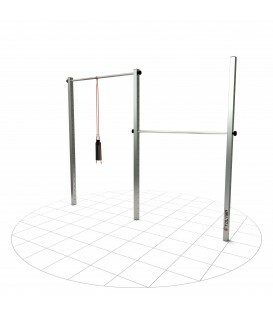 We offer dip bars, rung ladders, human flag poles, pull-up poles as well as gymnastic poles, which are specially manufactured for the attachment of gymnastic rings and loop trainers . 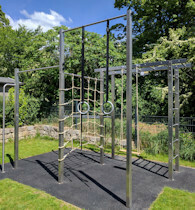 You benefit by being able to adapt the outdoor trim station individually to your requirements. 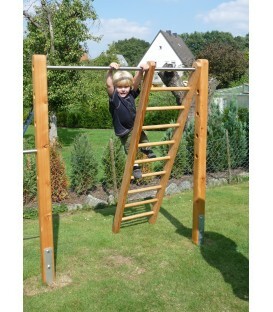 Furthermore, you can see on our pictures that such a high bar gymnastic apparatus is also very popular with children. 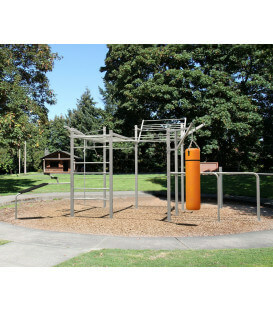 Consequently, our fitness centres and buildings are also regularly used as climbing tower and playground equipment. 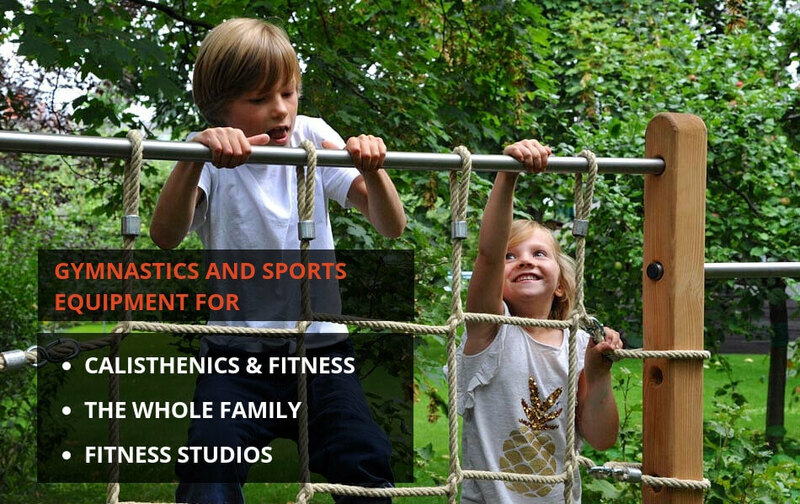 So mum and dad have sporty fun, where the kids can play at the same time and all that outside in the fresh air. 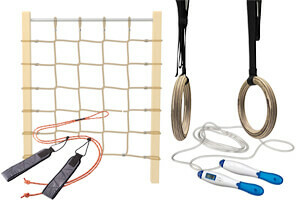 Therefore we also offer supplements such as a climbing net or a rung ladder. Of course you can also improvise. 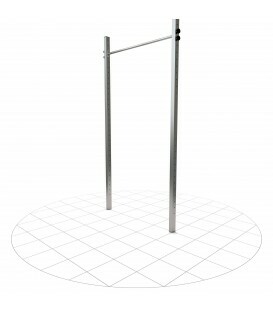 For example, the Human Flag Rod can also serve as a fire pole . 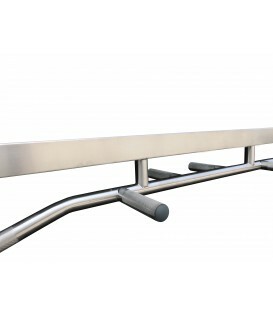 Furthermore, the horizontal bar is height adjustable. 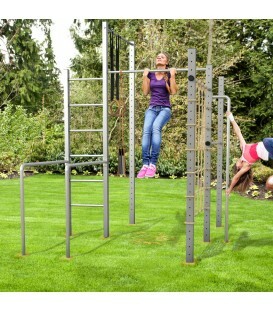 Your garden gym equipment can thus be used by the entire family - which is a sporty and healthy fun! Can they also be used in the nursery? Theoretically it is already possible, but the dimensions of our stations are often too large for this. In addition, you must also concrete the device into the floor so that everything is safe that is not always possible in the children's room. 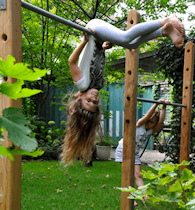 In addition, outdoor playing is also much healthier and should be promoted by us hereby. Nevertheless, we also have some articles in our assortment that can be used in the children's room. 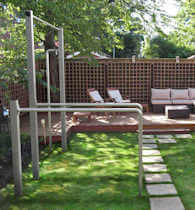 These are then our balancing or balance beams or pull-up bars. 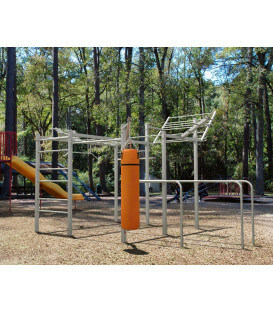 If you are looking for a jumping box or gym mats, benches or a trampoline, you won't find it here yet. If you want to do professional gymnastics, then you should visit a club. 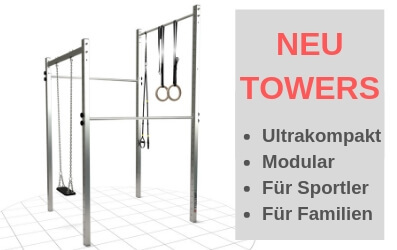 For the home training our offer in the shop is nevertheless suitable. Do you have any further questions? Then get in touch with us today. We are happy to advise you! 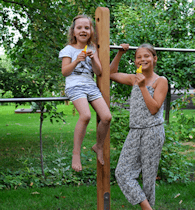 No matter whether gymnastics bench, gymnastics mat, uneven bars or stainless steel gymnastic apparatus - with apparatus gymnastics you promote the child's development. Even experts and scientists demand a corresponding physical strain at an early age. Most offspring of pre-school age are too unsportsmanlike and also have massive coordinative weaknesses and hardly any physical condition. More and more kids are suffering from overweight, but that doesn't have to be the case! Take advantage of the strong urge to move and support it with TOLYMP. Here we do not necessarily want to recommend only children's gymnastics, as club sports as well as team sports are also beneficial. 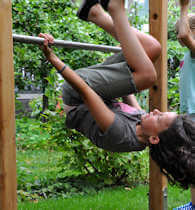 However, gymnastics offers the opportunity to gain experience in perception and movement. As a parent, you can set a good example with us. With our gymnastics equipment, kids can experience their bodies and develop a certain sense of security and body awareness. 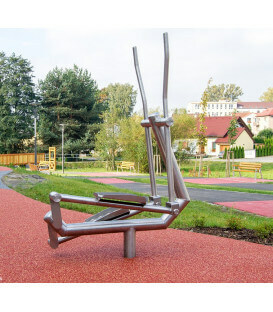 Since you are also active on the equipment, this also promotes the fun of exercise. It is important that you do not restrict the urge to move by overanxiousness. For protection we sell professional fall protection mats and sometimes you cannot prevent small injuries or aches and pains. Kids have to make their own experiences and that sometimes includes a fall. In addition, they learn to assess dangers themselves. Take part in sports. 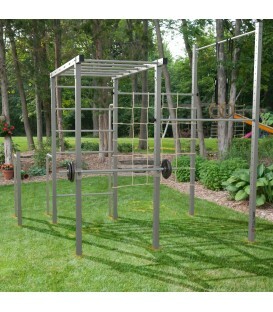 Buy a balancing bar and balance over it. 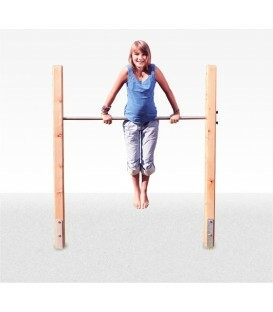 Build your own jumping box or use our bars. So you can combine gymnastics, sport and fun. 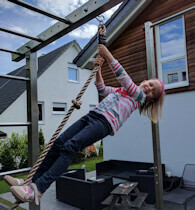 It is precisely this combination and connection between parents and children that we try to create through supplements such as rung walls or ladders. Of course, in addition to sporting activity, proper nutrition is also important. But that's another story. In the menu you can click through the individual categories and select exactly what you like most. If you have any questions about the product, please do not hesitate to contact us. 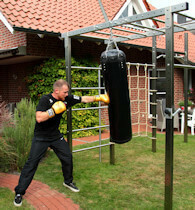 Our company is your personal partner in the field of outdoor sports equipment. We focus on quality and satisfaction, which you can see from the many positive customer evaluations. But how exactly does the order and shipping work? Basically, there are two different ordering procedures - the quick order and the detailed consultation with our planning service. After you have found the product you are looking for, add it to your shopping cart. Now you can buy more accessories or other devices or go straight to the checkout and complete the order. With some products you still have to make certain decisions. 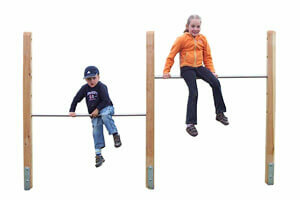 For example, you can select the special version of the Dip Buin Steelwood and also order a human flag pole. After you have decided here, you need to enter your billing information and we'll get started manufacturing your order. If you would like to have a plant completely according to your wishes, then you can make use of our planning service. We implement your ideas in a clear and understandable way using the latest 3D CAD technology so that you can get an exact picture of your dream facility. This is done in four steps. First you tell us your ideas and requirements, which can be done by phone or e-mail. It is also important that we receive further information about the site. This can be done through photos or sketches. We then design the system in 3D CAD and create various variants and design options. We will then prepare an individual offer for you. The offer includes various installation options. You will also find out the exact dimensions and delivery time. 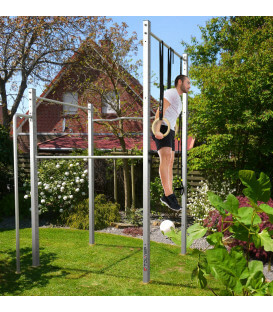 With the AUGMENT app you can virtually place your individual system in your garden or at the installation site and get an impression of the overall picture. Differences at home and club and school sports - what should you not expect? 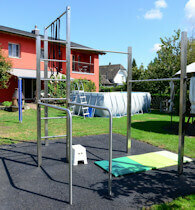 Children's exercise equipment for home use is not comparable to school gymnastic equipment. After all, we mainly use stainless steel and not wood. In addition, the gymnastics sport is not exclusively in the foreground. 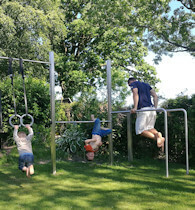 A healthy fitness with the own body weight of the parents and a sporty activity of the offspring is particularly important to us. 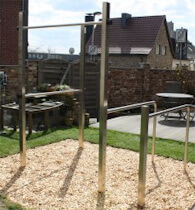 In club sports, for example, there is a pommel horse, several jumping boxes, which are underlaid with a soft floor mat. 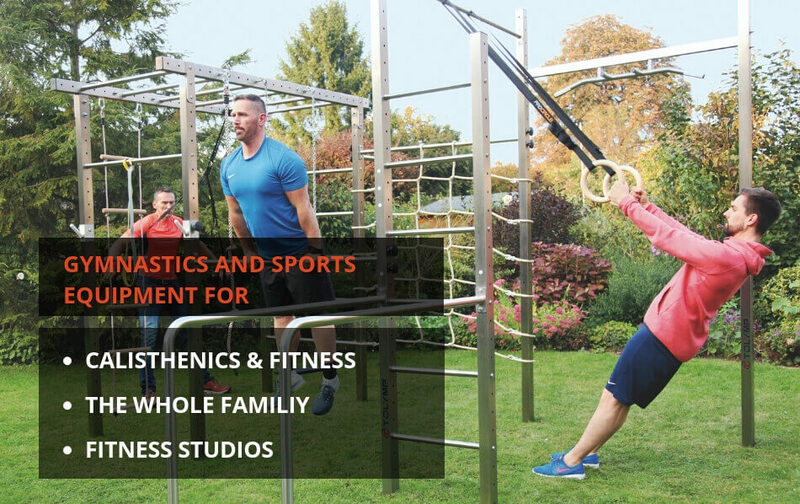 We are clearly more leisure-oriented, although there are also many fitness studios that use our goods. But the focus here is different. We want to support sports in general! 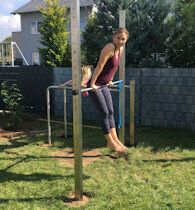 What to consider when doing outdoor gymnastics! In general, you can't do much wrong when buying from TOLYMP. It is important that you know the different advantages between wood and stainless steel. Although wood products are cheaper, they are not very durable. With our wood products, we also make sure that they are not pressure impregnated. This prevents pollutants from escaping. You must also have enough space in your garden. The planning service, which we provide for individual enquiries, will help you here. In our FAQ you will find answers to many questions. Nevertheless we are looking forward to hearing from you. We would like to briefly describe our assortment below. We do not want to emphasize every single product, but only the most important ones. In the menu you will find a more detailed overview. 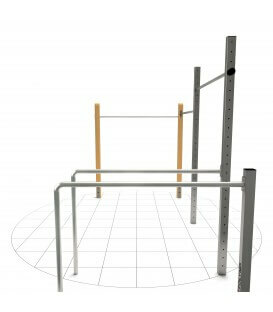 We do not only sell whole stations, but also extensions as well as individual parts. Have fun looking around! 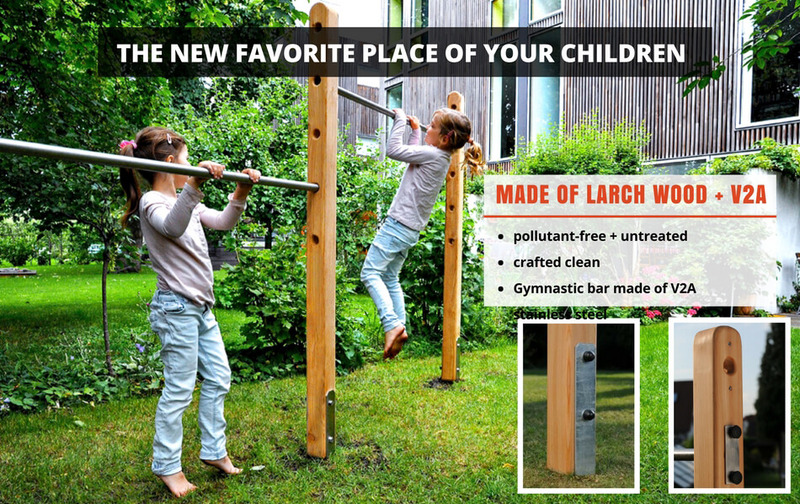 Gymnastic bars made of high-quality European larch and Gymnastic bars made of stainless steel are also produced under our own management. 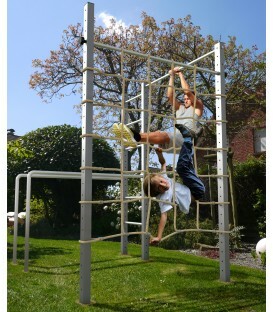 Ideally suited as a combined play and trim device for children, teenagers and adults to set up in their own garden. The larch is untreated wood from local growing areas, free of harmful substances, which we buy directly from a sawmill in Eastern Bavaria. 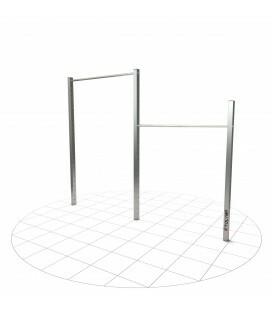 These gymnastic apparatuses are also available in different sizes and variants and can be extended with numerous accessories to a very personal gymnastics station. 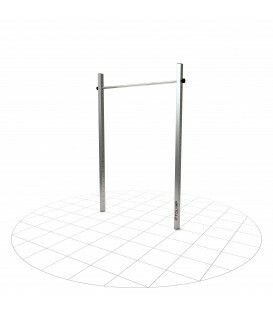 For even more fun and training, we also offer Gymnastics rings. 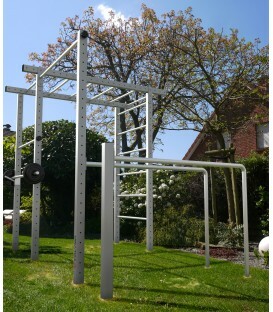 These are perfect for outdoor fitness exercises and are also used in the Calisthenics environment. After all, you have to keep your balance and perform certain movements at the same time. This places a much higher strain on the muscles than static exercises. 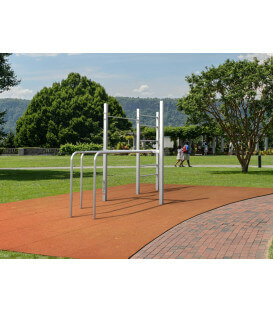 Fitness equipment and stations are more in demand than ever. After all, this trend is gaining more and more popularity, which is leading to an extreme increase in demand. 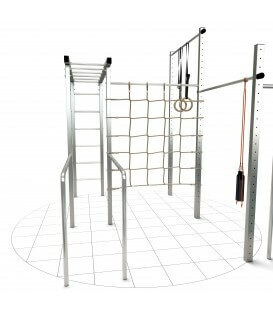 So that we can support your workout even better, we have decided to include the fitness stations in our range. 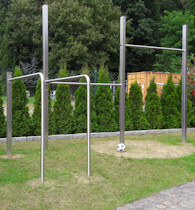 We have also designed them perfectly for outdoor use, so that you get a lot of your money for a very long time. The same applies to the calisthenic devices and stations. 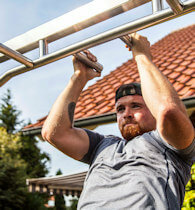 The workout with your own body weight is becoming more and more popular. 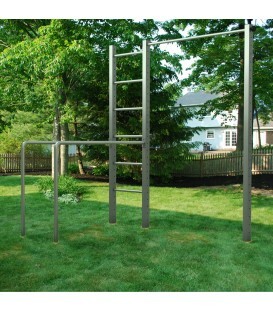 This is also referred to as functional training. 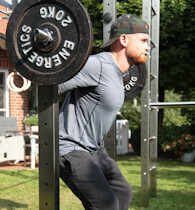 This is because the focus is not only on muscle thickness growth, but also on a healthy, athletic and functional body. 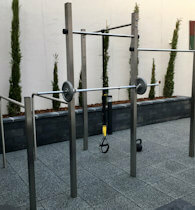 With our high-quality stations we support your Calisthenics workout. Satisfied customers and happy children are the best quality proof.